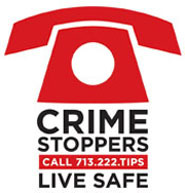 Crime Stoppers and the Houston Police Department’s Robbery Division need the public's assistance identifying a robbery suspect responsible for series of aggravated robberies with a deadly weapon. Over time, the suspect is becoming more aggressive in the robberies by jumping the counter and stating to the employees that he has a gun, although one has not been seen yet. Suspect description: Black male, 30 to 35 years old, 5’09 to 5’11, 200 pounds, black hair, medium complexion, black shoes, has worn a black Chicago Bulls cap.